"I believe that BJP is acting like how Aurangzeb imprisoned his father. Is this the way to treat elderly people?" Mr Kusmaria, 76, said. Former minister Ramkrishna Kusmaria has accused Madhya Pradesh BJP of ignoring "elderly" leaders. At a time when BJP leaders are seeking to rename a few places associated with the Mughal empire, a party veteran from Madhya Pradesh has compared it to emperor Aurangzeb. 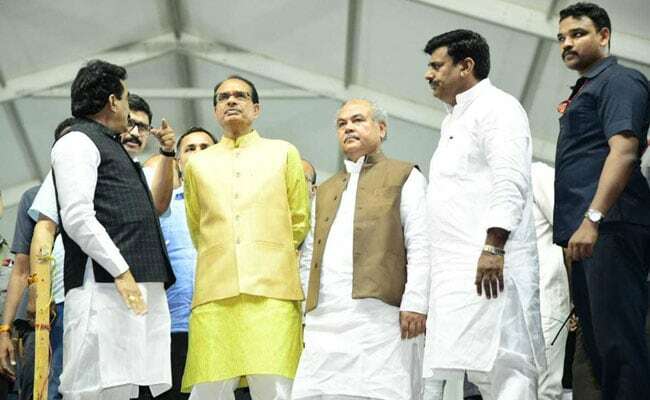 Ramkrishna Kusmaria, a former minister in the Shivraj Singh Chouhan government, has expressed his pain at the ticket-distribution process for the ongoing assembly elections in the state and said that the BJP "does not respect the elderly". "I don't understand what the problem is in giving tickets to the elderly. I believe that BJP is acting like how Aurangzeb had imprisoned his father and ruled. This is what they are doing now. Is this the way to treat elderly people? The party needs to respect such people," Mr Kusmaria, 76, said. Besides being a former Lok Sabha member, Mr Kusmaria was an agriculture minister in the Madhya Pradesh government and president of the Bundelkhand Development Corporation. The BJP leader claimed that people wanted him to be elected from the Damoh assembly constituency. He filed his nomination as an independent candidate in Damoh on Friday, alleging that the BJP ignored his demand for a ticket. Mr Kusmaria is a five-time member of parliament - he has won four times from Damoh and once from the Khajuraho constituency nearby. He has also represented the Pathariya assembly constituency in Damoh district. In the 2013 assembly elections, the BJP had fielded him from Rajnagar in Chhatarpur district but he lost to Congress' Kunwar Vikram Singh, who belongs to the royal family of Chhatarpur. Mr Kusmaria is not the only senior BJP leader who has complained of being unfairly denied a ticket. Four-time member of parliament from Hoshangabad, Sartaj Singh, who was also a minister in Shivraj Singh Chouhan's government, was seen crying after being denied a ticket by the BJP. Mr Singh, 78, subsequently joined the Congress and got a ticket from the Hoshangabad assembly constituency. The BJP is said to have a rule that people beyond 75 years of age cannot contest elections. However, the rule was allegedly relaxed during the Karnataka assembly elections earlier this year, in which 75-year-old BS Yeddyurappa was the party's chief ministerial candidate. The polling in Madhya Pradesh will take place on November 28, while counting of votes will be held on December 11.